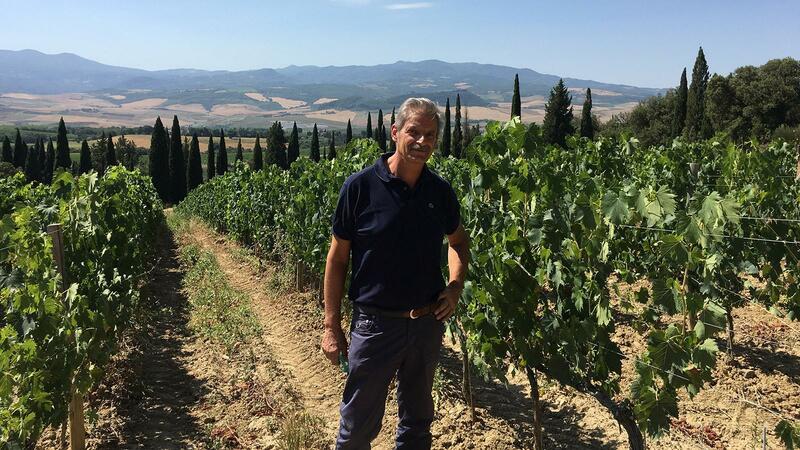 Carlo Ferrini is one of Tuscany’s great winemakers. But you probably have not heard of his tiny Montalcino estate, Podere Giodo. In fact, I didn’t know anything about Giodo until Ferrini drove me there along a rutted, unpaved forest road outside the medieval hamlet of Sant’Angelo in Colle—population around 200. “I must be discreet,” says Ferrini, 62. A tall, soft-spoken Florentine with silver hair and a thick salt-and-pepper mustache, he is one of Italy’s top consulting enologists. Giodo is his personal project, started over a decade ago, totaling about 1,000 cases a year of Brunello di Montalcino and a simpler IGT Sangiovese. But he keeps the wine low-key so as not to compete with his high-profile clients in Tuscany, which include Barone Ricasoli, Fonterutoli, Brancaia and Talenti. Along an alley of cypresses, he pulls his dust-covered station wagon up to an abandoned farmhouse surrounded by vineyards with stunning views over the rippling hills to the towering Monte Amiata. The son of a bus driver, Ferrini began his enology career in 1979 as a consultant for the Chianti Classico consortium. After 12 years, he struck out on his own. Over the decades, he helped modernize his clients’ cellars and viticultural practices—encouraging better clones of Sangiovese and more appropriate matches between sites and varieties—becoming one of the key players in the quality and style renaissance of Tuscan wines. But Ferrini saw huge potential in the mineral-laced slopes that faced southeast, shaded from the hot summer evening sun. As a consultant who has long emphasized investment in vineyards over winery technique, he set about planting 7 acres of Giodo (a contraction of his parents’ names, Giovanna and Donatello) with 15 clones of Sangiovese that he had selected throughout the 1990s for their low yields and high-quality grapes. Ferrini farms organically, with one full-time employee to take care of the vineyards. From Giodo's first vintage in 2009, Ferrini's harvest formula has been simple. In August, he green harvests, dropping about 40 percent of his crop. In September, the first selection of the best grapes goes into his Brunello di Montalcino. About a week later, a second pass in the vineyards goes to his IGT wine, made like a Rosso di Montalcino. In poor vintages, such as the rainy 2014, he skips the Brunello. Ferrini makes his wine in a corner of the cellars of one of his clients—artist Sandro Chia, who owns Castello Romitorio. Carlo Ferrini makes Giodo wines at Castello Romitorio’s winery. You can see it and taste it in his lively, ruby-colored wines that, on first impression, can seem almost Burgundian. Except for a few cases of wine that Ferrini sells to Florence’s legendary restaurant Enoteca Pinchiorri (a Wine Spectator Grand Award winner for its 4,500-selection wine list), the rest is exported primarily to North America and Northern Europe. Prices aren’t cheap: His Brunello (the 2011 vintage is the current release) starts at about $150 retail and his IGT (current vintage 2013) at about $50. For now, the house is a stone husk. There is no electricity or running water, but this summer Ferrini hired a crew to drill a well. He has cleared land for a tiny winery, designed to harmonize with the natural surroundings, to be completed for the 2019 harvest. He hopes his daughter, Bianca, a 25-year-old student in advanced economics, will join him making wine there. Ferrini has other dreams left in him—like making a fine cow’s milk cheese (he originally wanted to study cheese production) and making wine on Sicily’s Mount Etna, where three years ago he bought about 3.5 acres of Nerello Mascalese vineyards.